If you are about to launch a product or service related website, or you already have one; then Live Chat and Call Back, both of them, or you should embed either of them on your website. Both of them are known as the instant response tool and they provide similar functionality for helping prospects and existing customers on your website to engage and interact with the concerned person in a very easy and convenient way. Both of them are widely being used for generating sales as well as for providing technical support. Are you confused about which one you should choose and why? Don’t worry, by the end of this article, you will be able to make a choice. Before we go to the crux of this article and discuss which one is better, let us discuss Live Chat and Call Back one by one. 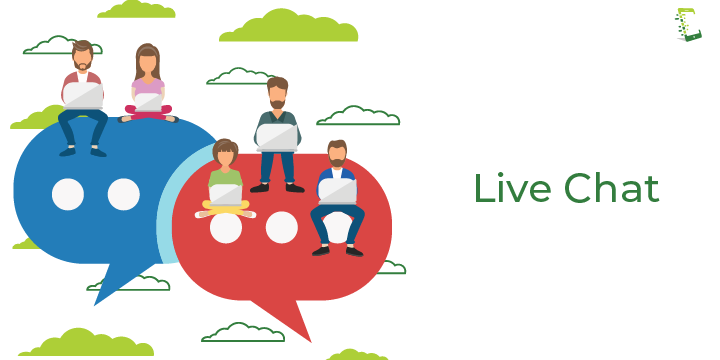 Live Chat is a type of digital software which allows easy communication between sales agent or technical support agent and customers or prospects on our website or mobile applications by texting each other in a very similar way we converse on Facebook and Whatsapp. Live Chat applications are being used by companies as a sole point of communication to handle all sort of customers and prospects. Chat widget on the website: This part handles visitors side view, it appears as a small chat box. On almost every website the chat box is displayed in the bottom right corner. Chat widget is visible on the desktops, laptops as well as on the mobile browser and also in dedicated mobile application. Live chat support agent application: This dedicated standalone or browser-based application is used by the support and sales agents to deal with the questions, queries, and doubts asked by the prospects as well as existing customers. Most of the agent application is made powerful by embedding additional tools like auto grammatical error indication/correction, template responses, typing indicator, the “message seen by the customer or not” feature, geolocation tracking, the “current page the visitor is on” tracking, tag feature to categorize chats and there are many other features depending on the particular application you are using. Passive communication: A communication that gets initiated when the website visitor hits the chat widget is known as passive communication. Active communication: A communication that gets initiated by the agent or automatically by the Live Chat application as soon as the visitor crosses the particular threshold of activities on the website which works according to the users’ behaviour on your website. For example, you can set “time spend on the website”, “the pages visited by the user”, “age of visitors”, “visitors geolocation” and “product added to the cart” as a parameter in the widgets settings, based on the parameters widget will show different options and suggestions to different prospects. Customized messages help you in gaining their attention as well as their confidence. After all, it is all about presenting the right offer to the right prospect at the right time. Live chat establishes an instant connection with the agent. There is no need to dial a number and hit many buttons before you can talk to an agent. In Live Chat the wait time is very less for the customers. It’s easier to help a user through chat instead of voice as links and tutorial can be shared dynamically while chatting. Customers always look for someone while making a purchase online. Live chat support during the checkout process will boost sales. Live Chat helps you in collecting valuable data. The pre-chat survey provides contact details, chat sessions also provide information, and post-chat reviews provide useful feedback. If you are dealing with global customers Live Chat helps you in bypassing language barriers. As the conversation can be translated back and forth in real-time. Live chat has a poor user experience. Predefined template responses are annoying to customers. They prefer a more personalized way. If the waiting time for an agent on chat is high, it is not good for your business as they might leave before you reach out to them. Unfortunately. more than half of the queries we get on live chats are irrelevant to the product and service we provide. Live chats do not provide very good quality of data because they still don’t link so well with analytics packages like Google Analytics. It is actually very difficult to assess the ROI of marketing channels like Google Adwords and content marketing with Live Chats. It is very difficult to convey emotions and tone over chat. Many times visitors find the pop-up chat window annoying and it negatively affects their experience on your website. Most Live Chat support software restricts the number of characters you can incorporate in a single message. This means you could face difficulty in communicating complex information to your customers. A word limit can also make your messages appear as cold and dull. If you are selling your product or services in a global market then your customers could be anywhere in the world with any timezone and hence, they require chat services 24/7. And 24/7 support is not an easy goal to fulfil. You must have been through many websites which has a box where anyone can drop his or her contact number. Later, the company who owns that particular website will receive the callback request and an agent from the concerned department will call the person who requested a callback on the number they provided. This is known as the CallBack tool. In some situations, the third party Callback service provider will call to the owner of the web site, and the user, then connect the calls together. And also in some cases, the web site owner receives a text message with the details using which they call to the callback requester. Call Back holds a great end user experience. Call Back is more personalized than predefined template responses that usually annoys customers. Most of the queries we get on the call are relevant to the products and services we provide. It is very easy to convey emotions and tone over a call as you will get an idea of the prospects mindset and current emotional state by the way he or she is talking. As you are on call there is no time restriction. This means you would be able to communicate complex information to your customers. Call Back decreases call abandonment rate. Using call back technology, you will never lose a lead even when you were preoccupied and couldn’t answer the call on time. As prospects contacts, details get recorded and the concerned agent contacts the requester as soon as he/she is free. Call Back helps you in gaining higher first call resolution. It leads to higher customer satisfaction, more effective utilization of agent time and fewer inbound calls. 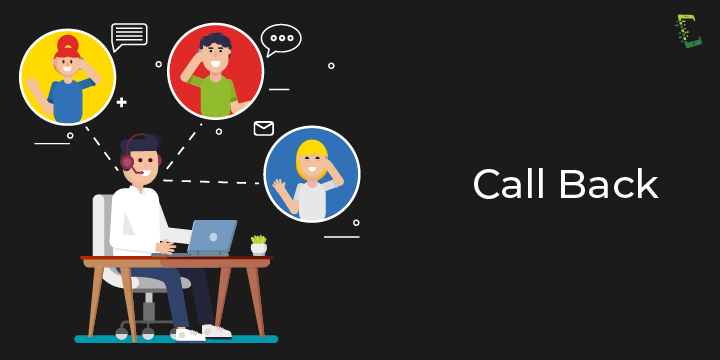 As before performing a callback, the calling agent gets ample time to trace the history and the necessary information of the customer before calling him or her back which finally reduces call abandonment rates. A Call Back option on your website draws in more profits. Customers are very happy with call back feature as it builds loyalty and as a result, they contribute more time to a company that offers it as a support option. Businesses need to find a way to incorporate Call Back to increase overall profitability. One person can only handle one call at a time. Skilled agents are needed as you need to resolve the issue in real time. Not ideal for low-value products with a high number of transactions. If you are having a global customer base you need to take in calling agents with good communication skills who are well versed with most of the accents like UK and US. It is hard to go through audio recordings of the calls if traceback is needed for any case. In this article, we explained Live chat and Call Back along with their respective advantages and disadvantages. We understood how different types of tools plays a great and different role in converting a visitor into a legit buyer. Live chat is really good for answering simple questions which can be answered in short statement. If the product or service is not very simple and needs the end user to understand the complex nature of the product then Live chat is not a suitable option. In such cases, you should go forward with Call Back. Call back tools are best suited for high value, low transaction items that require an agent to guide the customer through the process. It is critical to find out what your business requires before deciding which tool is best suited for your website. We also got to know that it is always better to go hand in hand with the new technologies. Stay tuned with this blog, we will keep updating the new types of tools that you may use to generate more and more leads in this fast-changing digital world. Should you have any queries related to Call Back or Live Chat in respect to the lead generation. Write to us in the comments section below.